Chen Yan’s first cruise was four years ago and somewhat different from his next one, in November. Not only are the ship and itinerary different, but so is the point of embarkation. Last time he had to travel abroad to get on board. This time he can embark at Sanya, Hainan province, the new home to Star Cruises’ SuperStar Aquarius, and the first time the city has been a homeport. The 51,039 metric ton cruise ship will call at three ports in Vietnam: Danang, Halong Bay and Hue City. 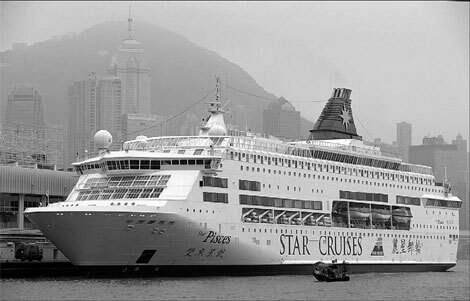 Hong Kong-based Star Cruises, part of Genting Hong Kong Ltd, bills itself as the leading cruise operator in the Asia-Pacific region. It is not the only company basing liners off the Chinese mainland. Two other international cruise companies will also sail their luxury ships to the country next year, against the backdrop of a growing domestic cruise travel market. In 2012, Miami-based Royal Caribbean Cruises Ltd will sail its 137,000-ton Voyager of the Seas from China while Costa Crociere S.p.A, the largest cruise company in Europe, will introduce its 76,000-ton Victoria to China. "China still has a far lower penetration rate compared with cruise markets in the United States and Europe, but this means there is huge untapped potential," said Michael Bayley, executive vice-president of Royal Caribbean Cruises Ltd.
William Ng, chief operating officer for Star Cruises, said: "China is now presenting us with a window of opportunity that can push the industry to the next level." Saturation in the traditional markets of North America and Europe and long-unchanged routes make it urgent for international cruise operators to seek new clients as well as exploring new destinations. China is a natural attraction with its rapid economic development and big population, said Ye Jian, president of the China Association of Port-of-Entry. In 2010, a total of 223 cruises visited the Chinese mainland, up 43 percent year-on-year, said Wu Wenxue, vice-president of the China Tourism Association, at the sixth conference of China Cruise Shipping in Tianjin. Of them, 95 cruises departed from China, revealing year-on-year growth of 18.8 percent, said Wu. "I believe the Chinese market has unbelievable potential, and that’s confirmed by the government itself," Royal Caribbean’s Bayley said. Local government efforts in boosting the cruise industry include investing in the construction of homeports, issuing favorable policies and establishing related industries. The development of Dalian International Cruise Terminal started on Aug 1, and Zhoushan International Cruise Terminal is due to be in service by the end of next year. The Hong Kong Special Administrative Region government has invested heavily in Kai Tak Cruise Terminal. The first stage of its construction will be completed next year. "From the cruise company’s perspective, we are obviously excited about the development of all the cruise terminals on the Chinese coasts and we are very positive about the working relationship and future development with local governments," said Bayley. In August, the Ministry of Transport and the Ministry of Commerce adopted a new policy that allows foreign cruise operators to set up solely foreign-owned operation agencies in China. "The policy allows foreign cruise operators to deal directly with customers in China, such as doing their own advertising and ticket sales," said Song Dexing, director general of the Bureau of Water Transport under the Ministry of Transport. In the past, international cruise companies had to work with domestic partners to operate in China. Costa Cruises’ application to set up a solely foreign-owned enterprise operating in China was recently approved by the ministry, a senior official said on condition of anonymity. Although the cruising industry in China is still in its infancy, a well-planned environment has already been set up for the "adorable child" to grow, said William Ng from Star Cruises. "I believe that the cruising industry will grow to become an ‘adult’ so long as we continuously provide the support that is needed," he added. The number of Chinese from the mainland who travel outside the country on cruises reached 790,000 last year, up 20 percent on 2009, according to industry figures. Meanwhile, foreign tourists coming to China on cruises increased by 15.5 percent year-on-year to 462,000. It is forecast that 100 million Chinese people will make outbound trips by 2015, and China will be the destination for another 100 million tourists from abroad, Ye said. Over the past two or three years, three major cruise operators – Costa Cruises, Royal Caribbean and Star Cruises – have developed Northeast Asia routes and Southeast Asia routes starting from Chinese ports. They are the primary choices for Chinese customers as these cruise voyages usually take six to seven days, a duration that ties in with holiday practices in China. "Actually, the holiday scheme in China has been a constraint for the further development of China’s cruise travel," said Cui Yuanyuan, an assistant researcher at Shanghai International Shipping Institute. Foreign cruise passengers have more flexible holiday schedules with some even taking a month, she added. Liu Chenjun, vice-president of strategy and business development at Costa Crociere, said that Chinese passengers are subject to public holiday schedules and paid annual leave is only available for a minority of people in first- and second-tier cities. "Therefore, we only design short voyages of around three to seven days," he added. The traditional Spring Festival and seven-day National Holiday are the peak season for cruise travel and tickets are usually sold out in advance, according to local travel agencies. In general, the Chinese want different things from cruises than customers in Europe and the United States. The Chinese care more about the routes and the ports the ships are scheduled to call at rather than the recreational facilities and luxury services on board. "It is essential for cruise operators to promote the concept of cruise travel to Chinese consumers at present because some misunderstand it," said Huang Ruiling, general manager of Mediterranean Cruises Travel Agency (Shanghai). For example, some relate cruise travel with the passenger ships along the Yangtze River and have no idea of the luxury services available on a cruise, she explained. In order to operate better in China, cruise companies also provide training to local travel agencies. "Once the cruise company develops a new voyage, they will train our employees to provide a more professional service to customers," said Qiu Guosong, a deputy manager of the outbound tourism department at a Shenzhen branch of China Comfort Travel Co Ltd.